Derry-born writer and translator Donal McLaughlin has penned a debut novel and a debut collection of short stories – the latter, An Allergic Reaction to National Anthems, was published in 2010. Colum McCann said of this collection: ‘the language is consistent and wonderful… and the great strength of these pieces is their collective impact’. McLaughlin has a very strong background as a translator and has collaborated with Janice Galloway on editing selections of contemporary writing, and he remains a successful translator, working in and around Scotland and Europe. He is currently situated in Scotland where he has lived all his adult life. For updates and further info on McLaughlin, see his website. 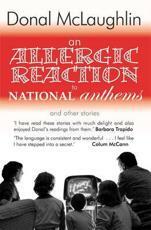 McLaughlin’s An Allergic Reaction to National Anthems was in the running for our inaugural Readers’ First Book Award in 2010. Each year, every one of the debut novels, novellas and short story collections appearing in our adult programme is entered into our First Book Award, and the winner is chosen by a public vote enabling readers to champion new fiction by voting for their favourite. Details of which authors are in the running for the award each year are announced here on our website when the Book Festival programme is launched in June.